I didn’t know it at the time – thought it was just us, small and isolated in Bristol city centre’s busyness. 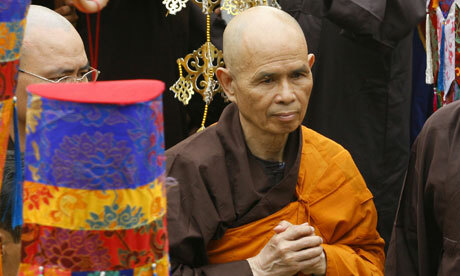 But It was a worldwide event, inspired by Tich Nhat Hanh for International Peace Day. In fact we were linked to hundreds (thousands?) of like-minded people across the globe, all meditating for a better world. Which is kinda’ analogous to how we normally see ourselves – as independent individuals, not really connected to most other people. But that’s so not true; “in fact, every happiness there is in the world arises as a result of others’ kindness.” (Geshe Kelsang) We are all interconnected. We all depend upon each other, in one way or another. We all drink the same water and breathe the same air. Life becomes easier when we can accept that. 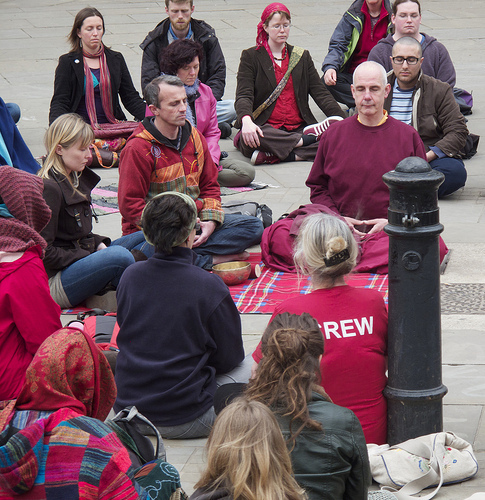 “Trafalgar Square, 10 minutes before the secret lift-off, was full, as usual, with summer crowds and precious few people that I could clock as potential meditators. It was warm and I sat on a bench to wait. I didn’t hear the lone woman singing at 6.30pm who was the signal, but I saw something even more startling. Across the square, from all sides, apparently uninvolved idlers strode forward purposefully to the designated area between the two large fountains. It was like Superman suddenly emerging from unobtrusive Clark Kent – or rather, around a hundred or so Supermen. It was simple to be impelled along on that sudden wave and to just sit down among the throng. And a deep silence immediately arose. I was astonished. There was a sense of naturalness and openness. The steady sound of the water in the two fountains, the grumble of traffic masked behind them, and a light hither and thither breeze. It felt not so much a comment on mad commercial London but more a coexistence with it – unifying in its effect rather than polarising. After 20 minutes, the low growl of chanting “Om” began and it rolled back and forth in waves, rising and falling until 7pm struck. And then it was all over. Standing up, the world felt different. I would have liked to have made eye contact with someone, or even hugged someone. But being British, I reverted to the conventions of public space. I picked up my things and left to catch my bus.